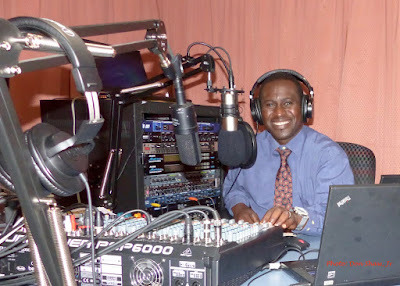 hosting this Good Times show which airs Saturdays from 12:00-2:00 p.m.
"Welcome to your greater Hartford African community radio, GhanaBeats Radio, broadcasting the heartbeat of Africa direct from our Bloomfield, Connecticut, USA studio." 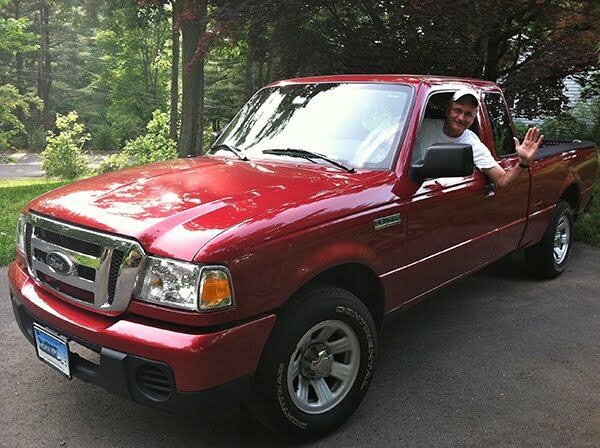 Yes, you read it right: "from our Bloomfield, Connecticut, USA studio." 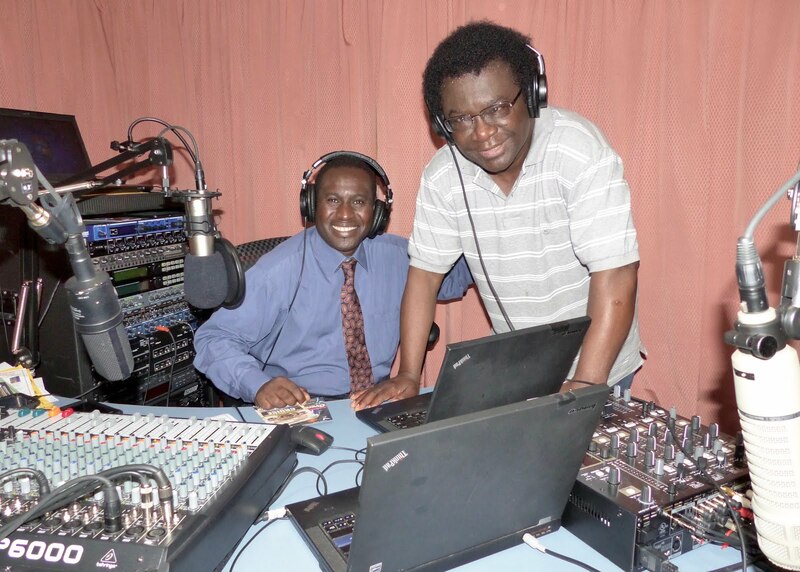 Georges Annan-Kingsley, an artist, author and teacher, and John Ackeifi, a computer engineer and entrepreneur, from Hartford and Bloomfield respectively, have teamed up to establish the first station specifically to serve the greater Hartford African community, with a mission of ensuring continuity of African culture and heritage to Africans who now call the USA home. Similarly, it serves to introduce the richness of African culture and history to the greater Hartford area, and what it can contribute to building bridges of understanding and acceptance in our diverse American society. I visited the studio this past Saturday at Annan-Kingsley's invitation. He and I met through our work on the Asylum Hill Welcoming Committee, whose mission includes helping assimilate immigrants and refugees into the neighborhood. 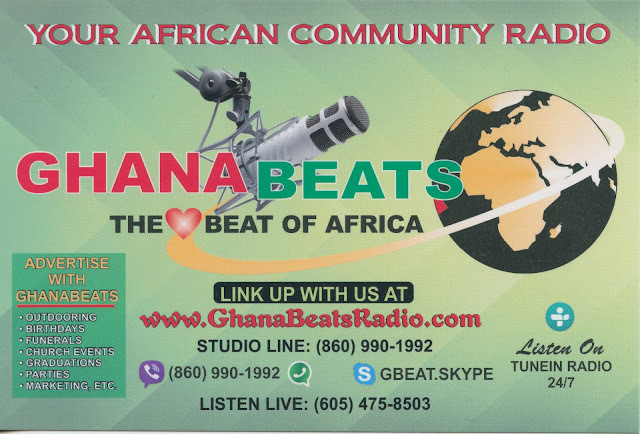 Originally, broadcast from Accra, Ghana's capital, GhanaBeats Radio operation was moved by station owners Ackeifi and Pat Ackeifi, his wife, to their Bloomfield studio this year now that they live in Connecticut. What made the transition easy was that GhanaBeats Radio is an internet station, not available through an actual radio, but accessible globally via a computer. From Bloomfield the station still can be heard in Ghana, in fact it has listeners from around the world. I know this because while I was being interviewed by Annan-Kingsley on air, a listener texted Ackeifi from Germany. founders of GhanaBeats Radio set up for Georges' radio program. Annan-Kingsley's and Ackeifi's shared entrepreneurial spirit, complementary talents, and common Ghanaian roots made for a natural team. Before relocating to the United States, Annan-Kingsley was Assistant to the Cultural Attaché for the French Embassy in Ghana, and was teaching at the National Institute of Art, University of Cocody-Abidjan, Côte d'Ivoire. Ackeifi, a computer engineer and entrepreneur, earned his undergraduate and graduate degrees in the USA. Broadcasts of joyous western and southern African music are GhanaBeats Radio's specialty. Shows are broadcast twenty-four hours a day, mostly prerecorded, but eight shows are hosted live by nine DJs, who can be heard at regularly scheduled times Friday, Saturday and Sunday. The hosts, whose roots are from Ghana, Togo, and Côte d'Ivoire, broadcast in English, French, or Ghanian languages, with plans to introduce Swahili very soon. The music is interspersed with local public service announcements and information about Hartford area cultural events. Near term plans are to increase public service content, and then longer term begin limited news programming. Listening to GhanaBeats' engaging music is comforting and uplifting, although, as I mentioned to Ackeifi and Annan-Kingsley, my lack of relevant language skills prevents me from enjoying the lyrics -- we all laughed -- "the words are all good" they said. Listen for yourself. It's all good. Great to have such a radio station in Connecticut. We will listen to programs and good African music in different languages. Will pass on the word to friends and family.